I really like the idea of a keepsake box. It may not be attractive to have a plastic bin out in the open so why not nest it another container to keep your sentimental items in sight? I suggest a wicker chest or storage ottoman perhaps. That way you can “visit” your sentimental keepsakes without having them hide in the back of a dark closet. Your division of objects worth keeping into “utilitarian” and “sentimental” reminds me of this quotation I love (which I’m sure you’ve probably used on here before) from William Morris: “Have nothing in your houses that you do not know to be useful or believe to be beautiful.” Beautiful involves more than just sentimental objects, but I think they fit into this kind of a mindset. I would add to this, that if you keep something that has a relation to a family member, you document that somewhere. I am in the process of photographing certain objects, and then I put the photo on my family history book with information about what that object is and how it relates to someone. For example, my great-grandfather’s wooden shoes – I have them on display in the living room, but my kids probably have only a vague idea of what they are or whose they were. That way I have the documentation somewhere, and we hopefully won’t lose the connection of why we are keeping that particular thing. This post is perfectly timed. My wife and I are in the middle of a move and are discovering that we have accumulated *far* too much stuff. I’m pretty sentimental by nature, and this post was a nice reminder to distinguish between the utilitarian and the emotional and the best of the emotional from the rest. Thanks! Instead of keeping a box of my girls’ baby clothes, I had them made into a quilt. Can’t wait to snuggle up in winter and reminisce! A while back I had to clean out a cedar chest that was full of my momentos, sitting at my parents’ house. (Reason why is a long story)… my first thought was “how am I going to part with all of this? !” But I had to…I certainly didn’t want it all coming to my house (that should have been a clue right there!) so I started taking pictures of everything and I was very surprised at how easy it was to let go. I found some things from my childhood that I got out for my girls to use and enjoy now, and I salvaged a couple of things that I couldn’t part with. But everything else that I thought was so special, I took a picture, tossed, and I’ve never thought twice about them. Haven’t even looked at the pictures. My family loves to give gifts. Over the years I always saved everything because it came from mom or sister or dear friend and I love them so much. But now when something doesn’t fit or isn’t useful or for whatever other reason is actually clutter, I say to myself “I love you mom, and getting rid of this item doesn’t mean I love you any less.” It helps! Great post, as usual. I have read about the idea to photograph sentimental items before, but discovered something odd- at least about myself- quite by accident recently. I have gradually decluttered a LOT over the past 10 years and generally have no problem getting rid of anything that is not supporting the life I am living right now (save a small suitcase full of sentimental items). However, I was looking through my photo album recently and came across a photo of my bedroom at my old condo and saw two items that made me think, “aww, I wish I had kept that”. It just struck me as odd, since I generally do not miss what I have let go of, yet seeing it reminded me of it and made me wish I had not let go of it, which is quite opposite the goal in taking a photograph in the first place. Not really a problem, since I’m in no danger of becoming a hoarder anytime soon (in fact, I like to call myself a “stage 3” declutterer…), but it is a curiousity. This post couldn’t have said it any better. The plastic keepsake box is the perfect way to store sentimental items. 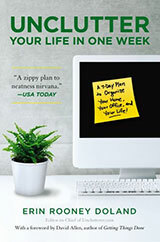 I recommend it to all of my organizing clients. Make sure you have one for every member of the house, and start one for each of your children to store their most precious schoolwork and art projects. I am so much like her! I’ll use all this advice in my daily chosing. You’re not the only one to have regrets about letting go of an item after viewing photos of it afterwards. We had exactly the same issue a few years ago when clearing out our mother’s home on her passing. Having a few items of sentimental value that you can integrate into your daily life/home design makes it a lot easier to give up a lot of other stuff. But having to sort and place a “value” as it were on some items, is very hard to do. Even if you’re not the sentimental type. And one caution, sometimes it makes more sense to wait before tossing stuff or even sorting. Grief takes time and it is not always a good idea to toss things before you’re ready. We’ve had friends who were like: OK. We have to get rid of this stuff now, just a few weeks after a matriarch died. Huge mistake. They are still beating themselves up over what they tossed and fighting with each other. Of course, sometimes there is no way to hang onto stuff for more than a short period (although we paid for a few months storage so that we could properly sort items and then prepare for a tag sale). Other friends, whose spouses passed, waited up to a year or more. At that time, they were able to sort through without as much emotional stress and pain and both were able to let go without regrets and with clarity. It doesn’t have to be an either / or, all or nothing effort. Toss in haste, repent forever. It would be great if we all had more “experience” memories than stuff so this wasn’t even an issue. But until this happens, we’ll continue to face the challenge of dealing with items of sentimental value. And going digital doesn’t make it easier. I recently helped a friend try to deal with the massive amount of computers, storage devices, etc. for a family member. You think it takes time to go thru physical stuff? Try sorting thru digital stuff. Really challenging given not only the amounts of stuff, but the various formats and electronics needed to access various types. Good tips! Another thing I’ve learned from experience: if you’re going to store things in plastic containers, and you live anywhere where humidity is an issue, put some silica gel packets (or a small pouch filled with a similar dessicant) in the bin. It can help paper not get warped and fabric not get smelly. Regularly airing out the contents of your box helps too. RE: Hiding important and useful sentimental objects in a box is a pretty lousy way to enjoy something. This was a hard one for me to learn. My mother and grandmother are weavers and make many practical items. G’ma made me several cotton dish towels and I kept them in storage for a long time because they were “Nice” or “Special” (not unlike the guest towels no one can touch, ha!). I finally started using them and you know what… I smile whenever I use them. I think they’re pretty, they work well (much better quality and durability than any store-bought kitchen towels I’ve used) and I think of my loving G’ma. Although I must admit, now that G’ma is 97 and can’t weave as well anymore (hand issues) I know these are the last towels of hers that I’ll have. Therefore, I am tempted to store a few away for when these eventually wear out, then I’ll have another batch to use for years. We did the preliminary sort of my parents’ things only 3 weeks after Dad died, since that was when the whole family could be there. That was a little too soon for me to make decisions on everything, so I brought a lot of things home to go through later. It’s now been 3 years and only recently I put together one photo album with some of their photos, and was FINALLY able to throw out the rest of them. It just takes time to make some decisions and it’s OK to do that in stages. Now I feel really silly, as the two items I “regretted” decluttering were not even sentimental! 😉 Both were things I had purchased myself- a pink and white coffee mug and a decorative doll- and I just thought they were pretty and wished I had them back. Neither were expensive to begin with and truth be told I could probably find them on eBay. Eh, it was not a huge “Oh, I made a mistake” moment, more like a little pang of regret. I just found it ironic that, had I NOT had a photograph of those items, I would probably never have even thought of them. As far as sentimental items, I think long and hard before parting with them. For instance, I have some china pieces that were my Grandmothers. I actually used them for years as my everyday plates and bowls, but never or rarely used the various other items (tea cups and saucers, serving platters, creamer and sugar bowl, etc.) and a couple of years ago I realized that eating from huge plates was not necessarily good for controlling portion sizes. I asked my Mom, sister, and sister-in-law, but nobody else wanted them so I finally packed them up and am going to try to sell them. Thing is, I can’t recall Grandma ever serving a meal in that china, so they are just things to me. It’s not worth even the 2’x 2′ space it would take to store them. On the other hand, I have a handmade doll that one Grandma made me and a handmade doll blanket from the other Grandma, as well as rings that each of them owned. Those things are VERY sentimental to me because they were made just for me. (Although, even then I had to put limits- one Grandma was quite the seamstress and made me dozens of cute little skirt and vest outfits during my grade school years. Imagine if I saved all of those!) I’m thinking of getting a large shadow box to put the doll and blanket in so I can display them in my bedroom while still keeping them from getting too dusty. I like the advice you give about sentimental clutter. My husband has been “listening” as he sorts through items that belonged to his father. My question is what advice would you give for dealing with sentimental clutter that is too bulky for the box? Your rocking chair example is perfect for my question since it wouldn’t fit in a box. What guidelines would you offer if the majority of someone’s sentimental items are too big for a box? Lots of pictures? Only utility items? A numerical limit (I.e. only 5 or 10 sentimental items too big for the box allowed)? Your advice on the small stuff is sooo good! I look forward to hearing more of your ideas! Enjoyed your view point on types of clutter. Thanks. 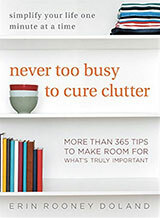 Have you done the 24 Things Challenge.. great way to de-clutter and today is day one! When I was first reading the blog, I kept thinking – just take a picture, soooo much easier to store, and why would you want to keep the actual article if you weren’t using it anyway? But after reading the comments, I realize that this is difficult for a lot of people. So now I’m trying to understand a different point of view. Which leads me to some questions…..
Why keep anything you’re not using? Isn’t the memory of it stored in your mind – a much safer place to keep it? For example, I fondly remember the first knick knack I ever bought – a small glass fish from the Coney Island Aquarium. I can see it clearly in my mind – the fish itself is long gone – to where I have no idea. But I’m happy with the memory – always pristine, always easy to find. Why keep the item? And I’m a believer of the quote mentioned above – William Morris: “Have nothing in your houses that you do not know to be useful or believe to be beautiful.” Does a diploma framed on the wall fall into either category? No – it belongs in a file. The memory makes you feel good – but the diploma itself? Face it, it’s ugly. And items from relatives. I’m beginning to think that stuff is just being kept as memory joggers. If that’s the case, wouldn’t a list of items and/or stories to go with them serve as a better jog then a box of things you never go through? I’m thinking that maybe I’m from Mars and everyone else is from Venus. Help me understand the mindset that would want to keep anything they do not use or believe to be beautiful………. @organizingwithe — “Beautiful” is subjective. There is not a Platonic ideal of every object that all of human existence agrees to. The diploma that you think is ugly may be seen as quite beautiful to someone else. One of my most prized possession, a thing I would cry about if it were to be destroyed, is a specific clothes hanger. I’ve explained the story related to the hanger to my husband many times and he still doesn’t fully understand why it means so much to me. To everyone else, it’s just a hanger with some string wrapped around it. To me, it represents so much more. If the story behind the sentimental attachment to the hanger were one I felt comfortable sharing with people who came into my home (it’s not), I would probably frame it and hang it on the wall. For now, it’s in my closet, and I smile every time I hang something up on it. Beauty, as they say, is in the eye of the beholder. We are actively decluttering, so I had a tough time when my mom said to go through her china cabinet and pick whatever I wanted as a birthday gift. I settled on a promotional item from my Dad’s long-ago business and a stocking hanger for the mantle. I think she was hoping I’d clean it out for her! For me, I have found it useful to keep sentimental items that I actually remember my grandmother using. When she passed away there were many items of china that she had received over the years as gifts for being in several women’s organizations. For the most part, they resided in a china closet. It was easier to part with those teacups and candlesticks that she never used and meaningful to keep the ceramic pitcher she did use to make cocoa and a large china platter that was used to serve Thanksgiving turkey (and that is still being used to serve turkey). My problem is that I find sentiment in the idea of someday using utilitarian items, and have trouble parting with those that I know to be difficult or expensive to replace. Likewise, I have a whole shelf of nonfiction howtos for projects I want to start if I could ever find the time – titles on improving my chess game, self-publishing, various aspects of computer programming, calligraphy, activism, coin magic, card games, graphic design, starting a business, juggling, gardening, string figures, negotiating, managing time (ironic, eh? ), plus dozens of other related topics. And I have the tools necessary to supplement each of these potential hobbies and projects. It’s not that I can’t let go of the guitar, or the paint set, or the camping equipment. It’s that I can’t let go of the idea of being a rock star or an artist, or even admitting to myself that the odds of finding the time to go backpacking in the next couple of years are slim to none. A diploma CAN be beautiful … OK, it probably isn’t, but I struggled to earn mine at a time when I very nearly got divorced. The fact that I got thru those classes and that my husband was there to watch the graduation ceremony makes the diploma nearly priceless and I like to display it! I have a regret – my grandmother knitted the most amazing, intricate pure wool afghans (not those awful crocheted things) that she gave me for my wedding. Anyway, I used it, day in and day out for years, and now I wish I hadn’t ’cause it’s gone, worn through, torn and trashed. I wished I had saved it instead of used it. I have nothing else from her so I regret not storing it properly as “clutter” and using it only to drape across my bed. This is a great post…I struggled with what to do with sentimental clutter for a long time. I finally got down to one plastic bin and my biggest road block would be cards. I been keeping the ones with actual letters written in them that mean a lot to me. The rest I just toss. Thanks! I work mostly with helping kids unclutter their rooms. For them, most of the stuff in their room is sentimental simply because they haven’t got as many years worth of memories, but those memories can pile up over the years. My sister and I (after our dad found the boxes of ‘keep forever’ school papers he’d been saving for us while we were at college, yet never told us where the boxes were so we could weed through them every summer) have decided on a plan to use with our other much younger sister and our cousin, both of whom have problems letting go of those random bits of paper. 1 filing box and a small plastic bin (I like the ones about 6 inches deep). Every summer, go through the piles of papers that accumulate through school and keep only the ones that fit in the file box. Sentimental memory pieces or craft projects go in the plastic bin and get rotated through some kind of display. I like the idea of taking pictures of some of the more bulky items and writing the story of why they’re important on the back. I label all of my pictures- a habit I learned from my grandmother who got tired of having to use the carpet in the background to figure out which baby was in the picture.